Schaerbeek is a jewel of diversity known for its Art Deco and Art Nouveau architecture, arts and innovations. The proud mascot of the commune is the donkey, reminiscent of the times when Schaerbeek was the cultivator of sour cherries, primarily for the production of Kriek (cherry beer). The donkey, representing perseverance, remains a solid historic symbol throughout the neighborhood. The following guide will help you make the most out of a visit to Schaerbeek. Shopping and cocktails come alive at Les Ecuries Bio Van De Tram, located in the oldest tram depot of Brussels and more historically still, in the ancient stables of Schaerbeek. Completely renovated, it transforms into a lively farmer’s market twice weekly and it is much more than just a market. It is a concept that integrates the social with the cultural and ecological and is organized by Maison Fondée. Every Friday the cocktail hour accompanies the market with an oyster bar, fresh breads, cheeses, vegetables, fruits, meats, and wines, art exhibits and an indoor wood-burning fire. The organic market is also open on Saturdays from 8:30 am to 1:30 pm and is located at Rue Rubens 95, a road connecting Rue Royal Saint-Marie with the Chaussée de Haecht. René Magritte spent the greater part of his later years in Schaerbeek, where he and his wife Georgette Berger completed their lives together in their home on Rue des Mimosas 97, in the Quartier des Fleurs (Flower Quarter), a neighborhood in which each street is named after the lovely spring flowers that blossom throughout the city in the months of April and May. Magritte moved to Brussels in 1916 to study at the Royal Academy of Arts and sold his first painting in 1926, which provided him the opportunity to capture his ideals through surrealism, a style of art where image plays with perception and reality with imagination. Both Magritte and Berger are buried in the Nouveau Cimetière of Schaerbeek, which is actually located in the neighboring commune of Evere. For extraordinary performances, concerts, celebrations, and mind-blowing artistic projects, Les Halles, located on the Rue Royale Sainte Marie, provides a spectrum of activities bridging the alliance between learned and popular culture, blurring the lines between disciplines and resonating with the active participation that characterizes this digital age. Every year during the month of May, Les Halles hosts a large party open to the public, Neighbors’ Day as it is called. It gets people outside to meet one another in the neighborhood. It is another way of experiencing the city, strengthening community ties and creating closeness among neighbors. It became part of a nationwide event, which then took on a European-wide scope and, as of 2014, the initiative has taken roots in over thirty-six countries and is officially recognized by European institutions. Right next to each other and facing Les Halles, you can discover more of Schaerbeek’s history, the Crazy Donkey and the Green Donkey. L’Âne Fou is as traditional as it gets for Belgium bistro experience, with an added cultural experience of historic Schaerbeek. Objects of all sorts decorate every inch of space in this cozy café with souvenirs of the commune dating back to the end of the 19th century and into the 20th, without forgetting the Schaerbeek donkey. You can also see other Brussels and Belgian icons such as Tintin. Numerous tourists, students, and culture lovers find their way to this café, and in the evenings when there are shows at the Halles, it can get very busy. On certain evenings the café itself hosts small live concerts, including jazz. A few doors down is L’Âne Vert, a fine dining experience of Belgian gastronomy with Schaerbeek heritage. On the lovely avenue of Louis Bertrand, lies the entrance to the Musée de la Bière founded in 1993 when eleven founders loaned their collection of around 300 bottles of Belgian beer to kick start the museum, which opened its doors in 1994. In the current version of the museum, you can prepare yourself to see a collection of over 1,000 bottles still in partnership with their companion glasses, historic beer making machines, pub and beer signs, old documents, and plenty more to taste, learn and experience. The museum is open on Wednesdays and Saturday afternoons from 2 pm to 6 pm. Take a walk through Parc Josaphat (Josaphat Park) in any Belgian season and you’ll find the beauty remarkable. Bathing in sunlight and warmth, the park is filled with families and friends; covered in snow, the park transforms to slopes for sledding and brisk nature walks. Josaphat Park also houses the greenhouses that produce yearly some 27,000 bi-annuals that decorate the green spaces of the commune throughout the year. Every spring, in the month of May, the greenhouses of Josaphat Park open their doors to expose their work, celebrate the spring, and teach growing tips for avid home gardeners. During the summer months, the park transforms into a space of live music concerts, storybook time for children, and just simply a nature oasis where spending all day in the park is a great pleasure. As you walk through the park you will see the home of Schaerbeek’s two donkeys. In July there is always the Cherry Festival, an event that remembers the agricultural and cultural history of Schaerbeek. The newly opened Train World, located in and as part of Schaerbeek’s railway station, creates a journey into history and a futuristic exploration of what lies hidden within the universe of train travel both in the past and future. It is considered not just another train museum, but rather an opera with the train as centerpiece. 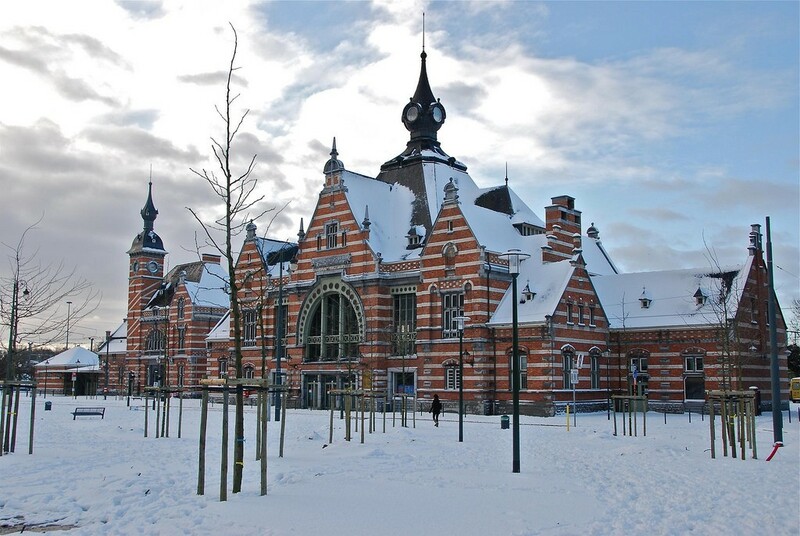 The museum spans the role of train travel across Belgian history and into international and global discovery. It covers the diversity of those who travel by train, from workers to families to aristocrats. Commuting has been crucial to Belgian history with its trains already transporting workers, families, and individuals since the mid-19th century. It takes you back to the time of the Expo 58, and you discover how and why the train itself played a key role in telling time. You will also see the originals of the Belgian history collection including ‘Le Belge’, the first locomotive to have been built in Belgium. In addition to the enriching cultural and architectural experience, visiting the glass-enclosed halls of the museum which connect the station to the city offers an opportunity for a spectacular panoramic view of Brussels. The Musée d’Art Spontané (Museum of Spontaneous Art) displays both permanent and traveling exhibitions of a category of art all of its own: spontaneous art. It’s a hidden little gem with some vibrantly colored paintings and filled to the brim with art ranging from art naïf to art brut. Art brut, or outsider art, was termed this way by French artist Jean Dubuffet to describe this form of art which is created outside the boundaries of the official culture. It is a form of art that is spontaneous, without cultural pretenses and without intellectual effort. L’art naïf, on the other hand, is a form of art such as drawing by children, which are pure expressions without transmitted knowledge. In the last several years, outsider art has emerged as a successful category for marketing art, with annual fairs and published journals dedicated to the subject. It is located on Rue de la Constitution 27 and is open from Tuesday to Saturday 1 pm to 5 pm. For a sweet experience and an exploration of another Schaerbeek neighborhood, step into Van Dender Chocolatier, an award-winning patisserie and chocolate maker specializing in all that they sell, from spiced and praline-filled fine chocolates, to cakes, breakfast breads, baguettes, and tarts. Their chocolate talent is considered to be one of the best rated on the Belgian market, and it is indeed this chocolate maker who provides to the King of Belgium. Today, chocolates are revered all over the world, yet it was even so as far back as 900 AD when cocoa pods were painted on the walls of stone temples and ancient artifacts depicted kings and Mayan gods drinking chocolate, especially during ceremonies and celebrations. The Mayan and Aztec cultures termed this drink “xocolatl”, which meant bitter water. The liquid made from adding water with crushed cocoa beans was mixed with chili peppers to form the basis of this liquid which was then poured from one cup to another until a frothy foam appeared. It was considered divine food, ‘food of the gods’, by the Aztecs and Mayans. Cocoa beans were also used as a form of currency and were the base force of the Aztec economy, which brought about a network of trade routes. Apparently, when the Aztecs conquered the Mayans, the taxes or ‘tributes’ they were forced to pay were exchanged in cocoa. Standing in front of Schaerbeek’s Town Hall, you’ll find yourself in Place Colignon, at the very end of Rue Royale-Sainte-Marie. You’ll find yourself first and foremost intrigued by the garden donkey, always well-groomed by the Schaerbeek greenskeepers. As you look up, you will see the architecture minutely detailed at the very tops of all the buildings surrounding the plaza. It is also a good place to stop and have a bite to eat in a café or have a fine Spanish meal rated by the Michelin Guide, or just an ice cream in the local parlor where you can taste any and all of the homemade ice creams. This plaza on which the Town Hall sits was inaugurated by Leopold II in 1887; it is named after the governor of that time, Achille Colignon, who died in Schaerbeek in 1891 and is known for serving as Lieutenant-General in the Belgian Army as well as professor at the Royal Military School in 1841. He invented the water cannon and served as Town Hall governor from 1879 to 1891. In 1911, a ravenous fire burnt the Town Hall to the ground. Albert I rebuilt the identical structure in a larger format and inaugurated it in 1919. Although the structure has changed over time, the name has remained the same.